1. "ON" : turn on button. 2. "TIME" : 6 hours on and 18 hours off per day. 3. "OFF": turn off button. 5. "DIM-/DIM+": adjust the light. Remote Control: Operating range up to 16.4ft/5Meters，please make sure the remote point directly to the battery case. [Safe and Portable]-4.5v Low voltage low heat,no worry about overheat issue, safe for your families and friends,Best gift for your baby. you can easily carry and place the led lights anywhere you like. 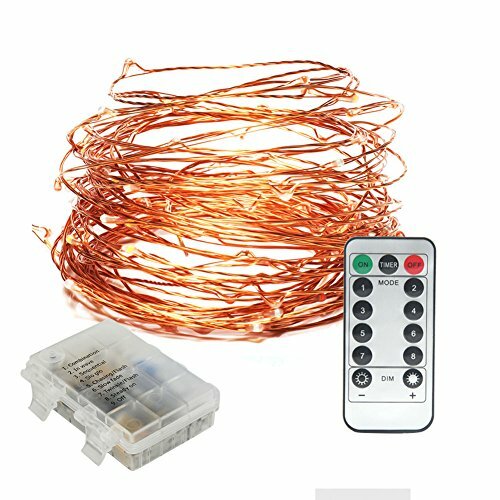 [High Quality]-Powered by 3 AA batteries(Not included),LEDs on durable and heat-resistant copper wire,Made from high quality copper wire that is thin and flexible. [friendly+Wireless]- Great and elegant brightness quite friendly to your eyes. Control the string lights remotely with 10 brightness levels and 8 different modes. [Multi Purpose]-The battery lights on copper wire could be curled into any shape for wedding or other holidays' ornament,bedroom,gardens,fence, flowers, lampshades, door eaves, wreath,etc.The loving light given off is guaranteed to be perfect for any atmosphere. [Waterproof outdoor/indoor lights] - IP67 waterproof level, party lights for both indoor and outdoor, withstanding humidity under conditions where frost, snow, moisture, raining are possible.